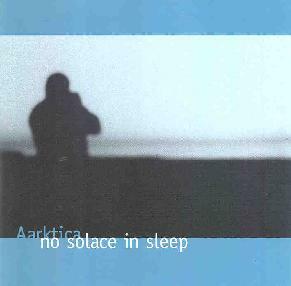 Aarktica - "No Solace In Sleep"
Aarktica is a solo project of Jon DeRosa who combines guitars and electronics to create haunting ambient/drone soundscapes. Ambient/drone is a good description for Aarktica's music. The drone is present in the form of stretched out singular themes that pulsate deep in your chest, but are tamed and made quite beautiful by the ambient elements. As you might expect, the music develops very slowly, but subtle changes arrive frequently resulting in music that travels down a linear though varying path. Imagine being in an empty, acoustically perfect concert hall, with only a piano on the stage, its strings being raked lightly and lovingly to produce atmospheric meditative space drones. Reviews on the Aarktica web site make comparisons to Flying Saucer Attack, Windy & Carl, Mogwai, and Labradford, though I hear a fair bit of Eno as well. My favorite tracks are "Inebria" and "I Remember Life Above The Surface", both ambient journeys through the coldest and darkest reaches of space. Drones and howls weave their way through the blackness with only pure sound to conjure up images of what it might be like up there. "The Ice (Feels Three Feet Thick Between Us)" has more distinct keyboard sounds than the pure texture that characterize the previous mentioned tracks. Along with the chanting the effect is to place this more in the heavens than space. On "Indie" the guitar is the more noticeable leader and there's even some light percussion. "You Have Cured A Million Ghosts From Roaming In My Head" has nice guitar patterns against atmospheric drones. And "Welcome Home" is solo guitar track that features nice music but isn't nearly as interesting as the rest of the album. A solid effort that fans of ambient music and general space electronica should check out. For more information about Aartkica you can visit the Silber Records web site. Sound files are available at the Aartica Mp3.com site.